Certainly points for originality. I was drawn to this book by the “Coupland meets Tolkien” blurb on the cover, but found myself enjoying the amusing concept more than the book itself. The ending seemed to drag on longer than it should have – with the characters basically carrying the couch to its final destination for the last 40 pages – and in the end there was really no big payoff. I’m all for ambiguity at a novel’s end, but this one failed to wrap things up in anything but a trite way. 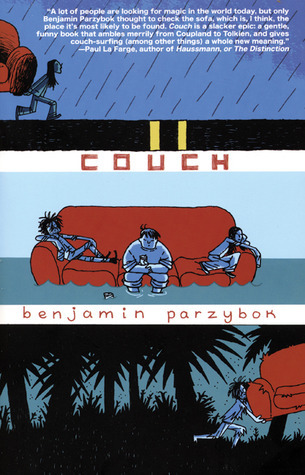 This entry was posted in Book Reviews and tagged Benjamin Parzybok, Book Reviews, Fiction. Bookmark the permalink.